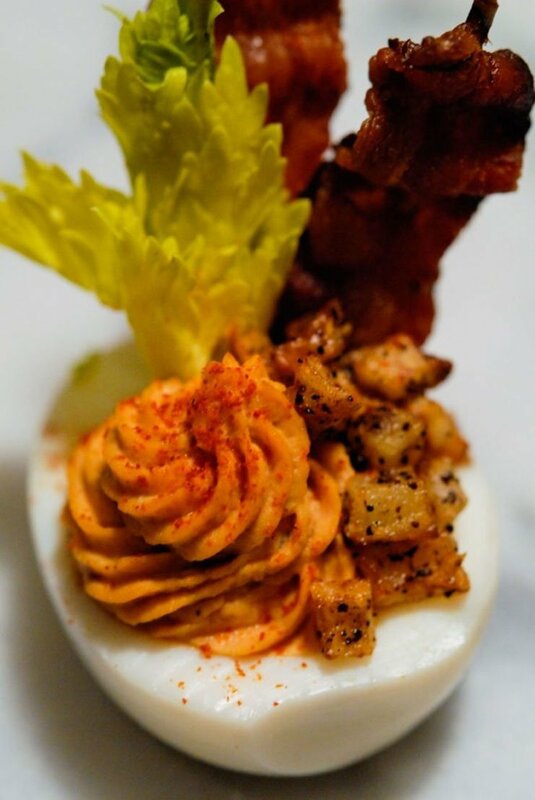 These Bloody Mary deviled eggs with bacon and mini hash-browns take a bit of patience, but they’re sooooOOooo worth it. 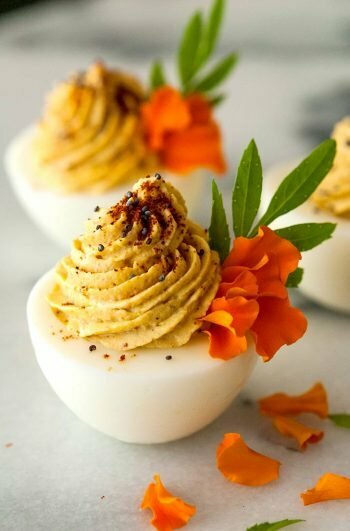 One of the most fun little deviled eggs to serve with brunch. I like to serve these when I’m not serving actual Bloody Marys. That way, guests can have their Mimosas and a Bloody Mary too. This recipe also includes instructions on how to make those yummy bacon flags and the teeny tiny hash browns. It's a 4-course brunch in a single bite! Eggs, potatoes, bacon and a perfect Bloody Mary. 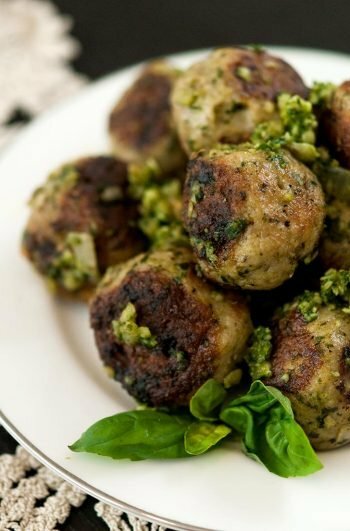 You’ll require a pot, mesh strainer and mixing bowl for this recipe, as well as a frying pan. 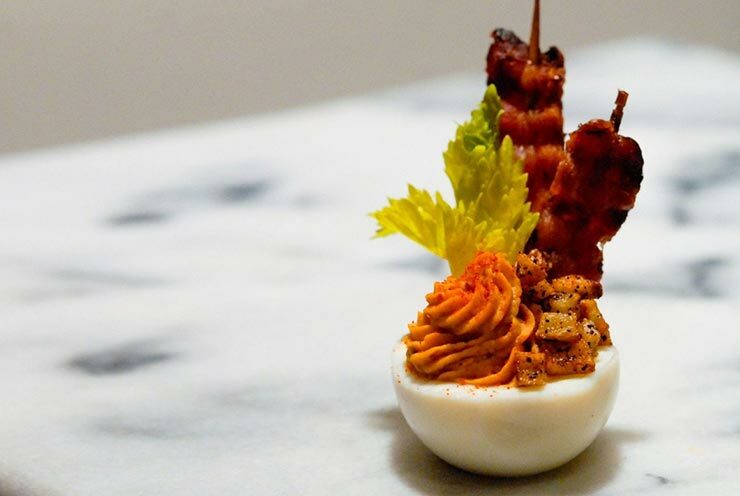 It’s also nice to use a party piping bag and pretty tip so that your eggs are extra fancy. 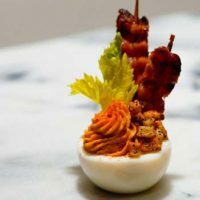 While your eggs boil, make your bacon flags. Cut a strip of bacon in half center-wise, then fold each piece lengthwise. Sew the toothpick through the center and lay on a tinfoil-covered baking sheet. Bake at 350 for 15 minutes. Remove the yokes by simply sliding them out, or using a very tiny spoon, making sure to keep the whites free from rips or dings. Push them through the mesh strainer into your mixing bowl. 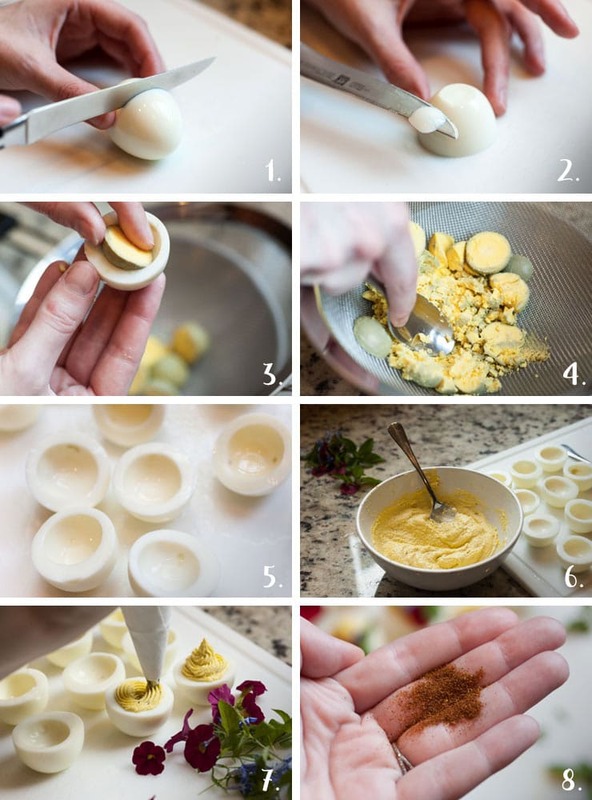 This will ensure your eggs are creamy and smooth without any eggy chunks. Mix in your mayo, creamy horseradish, cocktail sauce, mustard, tabasco and Worcestershire sauce. Give it a taste and see if it could use a little salt and pepper. Set aside. Spoon your egg mixture into a pastry-piping bag and add to your little egg halves. You can also just spoon it into the eggs too, but it doesn’t look as pretty. Carefully add your bacon flags by poking them into the egg whites, gently place your tiny hash browns around the side and add a pretty little celery leaf.